Whether hot water is being used or not, a tank-type water heater is designed to keep the water in the tank at a certain temperature (typically between 120F and 140F). The tank’s electric heating element or (in gas and oil-fired models) or burner automatically comes on when hot water is being used, because a fresh supply of cold water enters the tank to replace the hot water leaving the tank. But even when there’s no demand for hot water, standby heat loss causes water temperature in the tank to drop sufficiently to trigger the reheating cycle. New tank-type water heaters with ENERGY STAR® ratings have thick layers of tank insulation to help reduce standby heat loss. If your water heater is an older model that doesn’t have an ENERGY STAR rating, it probably is wasting a good amount of energy (and costing you extra money) because of standby heat loss. If you’re not ready to upgrade to a new ENERGY STAR water heater yet, a good interim step is to have water heater insulation installed. A tankless or "demand" water heater is a great alternative to a standard tank-type water heater. This type of water heater can cut your water-heating expenses by as much as 40%, simply by eliminating standby heat loss. A tankless water has a heating element that only comes on when you turn on the hot water tap or an appliance (washing machine or dishwasher) that requires hot water. Instead of being “on” all the time like a tank-type water heater, a tankless water heater doesn’t consume power until hot water is called for. 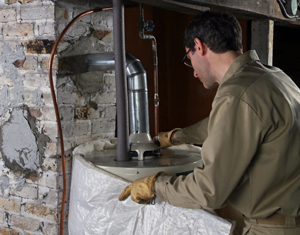 Heating action occurs quickly with a tankless water heater, minimizing your wait for hot water. Remember, water heating is the third-largest energy expense in most households. If you have an old water heater and want to make an energy-saving upgrade, talk to a home energy specialist about having a tankless water heater installed. To schedule your free quote, call or e-mail us today! We serve Bridgeport, New Haven, Hartford, and surrounding areas such as Stamford, Waterbury, Norwalk, Danbury, New Britain, West Hartford, Bristol, and many areas nearby.